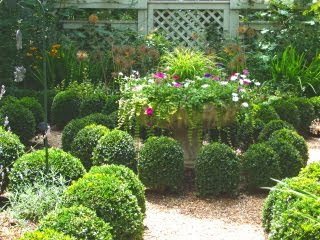 The center of attraction in any garden space, whether it's a large formal garden or a part of your deck or patio, can be well designed containers. At Abbington Green we have many containers...I just like them, both for the architecture they add and for the wonderful plants you can put there. 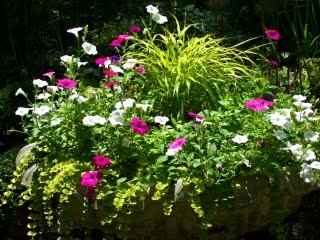 Throughout the year, containers can be changed to fit the season. And right now the lovely summer annuals are bright and 'doing their thing'.This example is in the center of our Lower Garden. 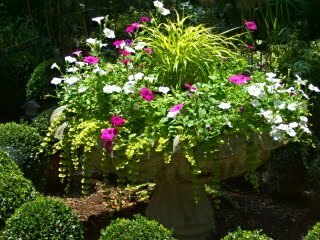 I like mixing colors of foliage as well as flowers...so you'll see chartreuse foliage as well as medium green in this central planter. 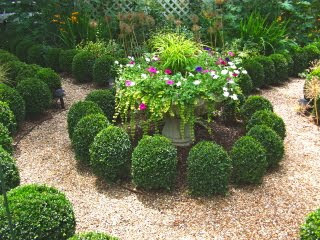 Also, always consider the shape and texture of foliage to add interest. Summer is in full swing in Asheville NC. I hope you'll have the opportunity to visit us soon!